The world at large and lacemakers in particular have lost a remarkable woman. 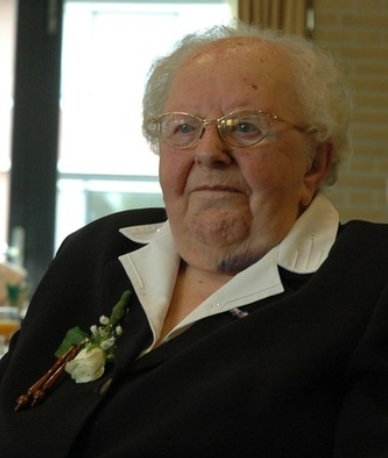 Sister Judith de Kreijger died last Wednesday at the residential complex of the Franciscan Sisters in Etten-Leur, on the grounds of the former Withof convent. She had reached 100 on September 21st, and until a few weeks ago, was still actively teaching. Sr. Judith on the occasion of her 100th birthday. Elze de Kreijger was born on the 21st of September 1913 in Aardenburg in the southwest of The Netherlands. Her parents were quite wealthy and she had, in all aspects, a wonderful childhood. When she was 13 she went to the Lace School in Sluis where she was an excellent student and lace became the love of her life. She later worked as a youth counselor. Her parents were not very happy with her decision to become a nun, but she told them that she knew that this was something she had to do. She wanted to do a lot of good for children and that she thought that a convent, with schools and boarding schools, was the best place to accomplish this. At the age of 24 she went into the convent with the Fransiscan Sisters, taking the name Sister Judith. The Withof convent was in the village of Etten, in the south Netherlands. The sisters were called “The Franciscan Sisters of Etten”, and later the villages of Etten and Leur grew together, now called Etten-Leur. Although she worked in different places, Etten-Leur was always her home. The convent building itself was recently sold to the municipality, and the few remaining sisters moved to a retirement facility on the former convent grounds. Life in the convent turned out to be hard and, as she told me when I had my interviews with her for the biography, she realized over time that she would have had better opportunities to fulfill her ideals if she had not been in the convent. I asked her why she still stayed and she said that she had made her choice and her mother had taught her to finish what you started. Till her very last days she spoke with admiration and love about her mother. She retired at the age of 65, meaning that she did not have to work anymore, but she stayed in the convent. 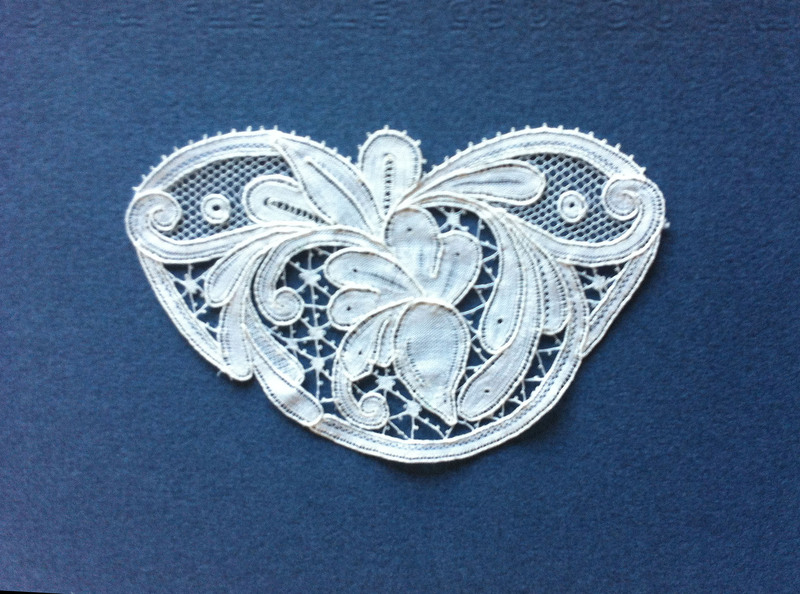 Around that time her career as a lace teacher started. It was the beginning of a very successful 35 years of teaching, training hundreds of students. With her students she developed – out of the Sluis Duchesse she had learned when she was young – the Withof Duchesse, named after her convent. She was a talented designer and there are thousand of beautiful designs, worked by her students. Over the years her students went all over the world to teach Withof. By now there are many excellent teachers, for example Susie Johnson in the USA. Many of her students were, till a couple of weeks ago, still coming to the convent for lessons. And many of her students became good friends. When we celebrated her 100th birthday, on the 21th of September, so many students came to her party. It was a day she enjoyed immensely. And now, one and a half month later, her life is over. She will be missed, but she leaves so many good memories. And thousands of designs that will be well cared for. A ceremony and internment will be held on Monday November 11th starting at 14:30. She will be buried on the convent grounds, with her lace friends as pallbearers. For her 100th birthday, Sr. Judith asked for donations for projects in South Africa, and memorials can be directed there. Write to Anneke at anneke@reijs.nl for information. 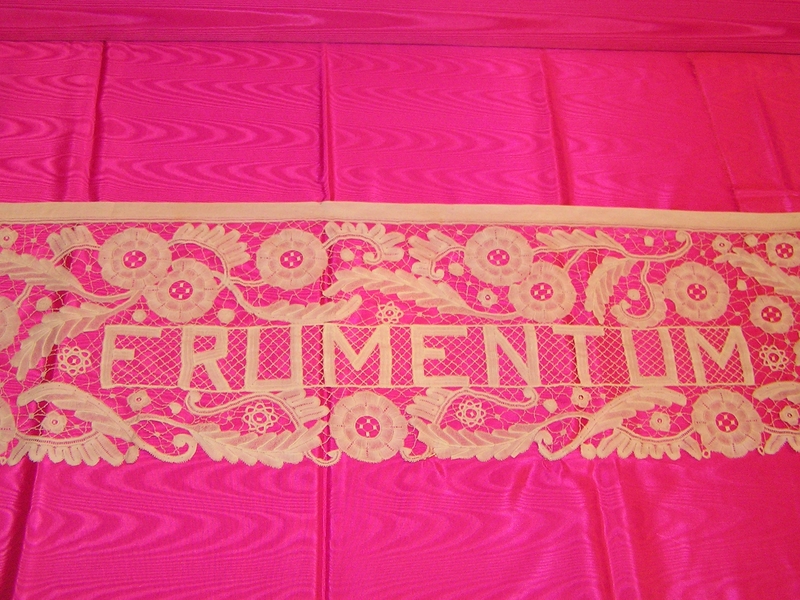 Left: Part of an altar cloth that Sr. Judith made after she entered the convent. It is worked in Sluis Duchesse. Right: Withof Duchesse medallion worked by Anneke Reijs. The ‘rolled’ thread technique which outlines every edge was developed for Withof. It gives the lace a remarkably crisp and bold visual effect. 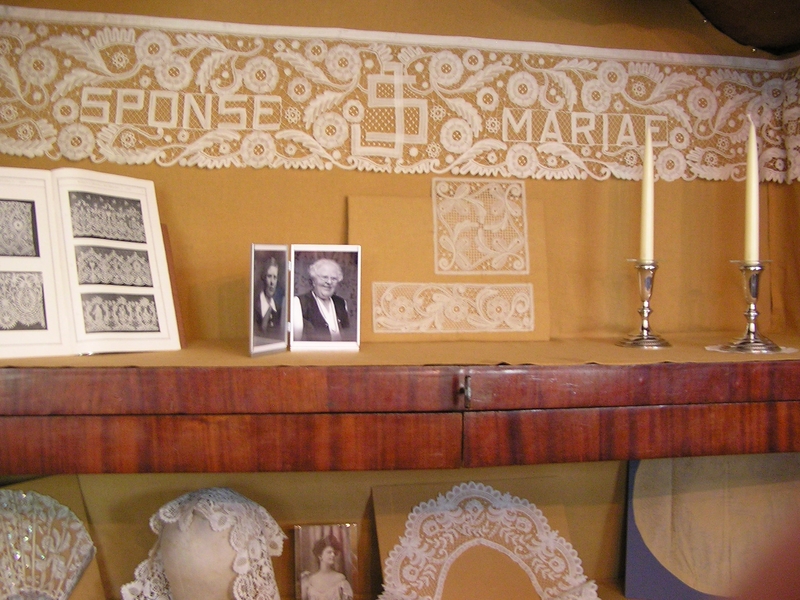 Several pieces made by Sr. Judith and shown at an exhibition in Denekamp, The Netherlands, in 2008. Zr. Judith, “Withofkant en Sluisse Duchesse”, 1998. And additional nine pattern books on Sluis and Withof Duchesse Lace. Hundreds of patterns, almost all by Sister Judith and worked by her students. The first one was made at the beginning of 1980, and number 9 in 2008. Anneke Reijs, “Elza De Kreijger, Sister Judith, A Life In and With Withof; A Biography” (English and Dutch). Anneke Reijs, A Manual for Sluis and Withof Duchesse Laces – Part I – Sluis 1913-1935 1, 1992, revised in 1994. (Dutch and English versions). Anneke Reijs, A Manual for Sluis and Withof Duchesse Laces, Part II – Withof, 1993 (Dutch and English versions). Anneke Reijs, A Manual for Sluis and Withof Duchesse Laces, Part III, Withof 1993-2000 (Dutch and English versions). Trude v.d. Heijden-Biemens, Yvonne Scheele-Kerkhof, Puck Smelter-Hoekstra, “Withof Duchesse”, 1988, Uitgeverij Terra Zutphen. Trude v.d. Heijden-Biemens, Yvonne Scheele-Kerkhof, Puck Smelter-Hoekstra, “Withof Lace”, 1991 (English). Susie Johnson, Kathy Kaufmann, Jeanette Van Ord, “Withof Duchesse in North America”. Yvonne Scheele-Kerkhof, “50 Dutch Bobbin Lace patterns: Withof & Duchesse” , 1997 (English, German, Dutch, French). Yvonne Scheele-Kerkhof, “Withof and Duchesse Lace Patterns”, 1998. She was a great Lady and is at peace with her Lord. A Paypal account has been opened for memorials for Sister Judith, proceeds to go to missions in Africa. The account is blomlace@gmail.com. I’ll get more information shortly.